San Diego Gas & Electric - Hire G.I. SDG&E is a regulated public utility that provides energy service to 3.6 million people through 1.4 million electric meters and 873,000 natural gas meters in San Diego and southern Orange counties. Our service area spans 4,100 square miles. We employ more than 4,000 people who work every day to deliver the energy our customers need. Sempra Energy is a San Diego-based Fortune 500 energy services holding company whose subsidiaries provide electricity, natural gas and value-added products and services. San Diego Gas & Electric and Southern California Gas Co. are Sempra Energy’s regulated California utilities. 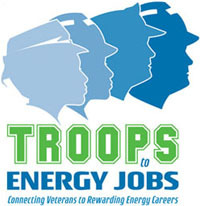 Through our partnership with the Center for Energy Workforce Development (CEWD), the Troops to Energy Jobs website, provides veterans a clear pathway to landing a job in the energy sector. Through the site, veterans are guided step by step in transferring their military training to a new energy job, identifying any additional education and credentials needed, along with providing the resources to get that additional training. Veterans can locate and apply for jobs based on positions that best match their military experience and desired location. This is all done with the ease of utilizing the sites interactive Troops to Energy Jobs Roadmap.